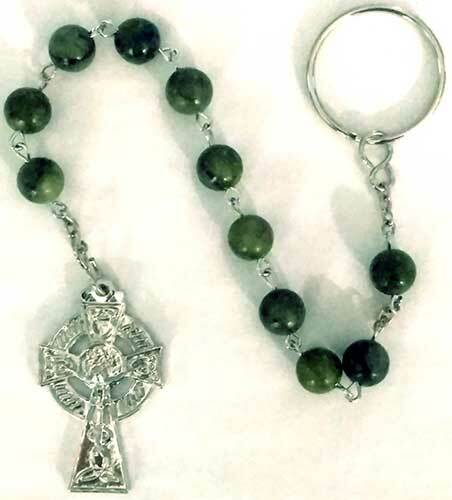 The Connemara marble beads that is featured in this Irish rosary is the only natural green marble in the world; fittingly, Connemara marble is only found in Ireland. This genuine Connemara marble penal rosary is the An Paidrin Beag which translates to the little rosary in English. This single decade Irish rosary with round 8mm Connemara marble beads is a replica of the kind used in Ireland during the penal days when the Catholic faith was outlawed. The Connemara marble rosary is 9 1/2" long with a silver tone metal Celtic cross that measures 3/4" wide x 1 1/2" tall. The little Irish rosary is gift boxed with Celtic cross and Connemara marble history cards, complements of The Irish Gift House. The uniquely Irish Connemara marble pocket rosary, with a key ring, is made in Ireland by Lisibach.